Our Manggad Kang Antique or The Treasures of Antique Heritage Tour continued after the visit at Bugasong and we had a quick break from all the day's destinations at the Tibiao Fish Spa 'til sunset. 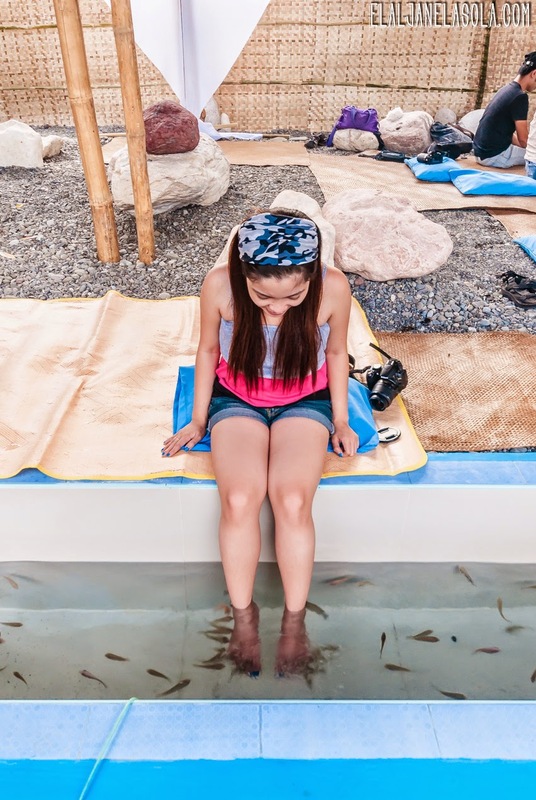 I have been to a number of fish spa places but never fully tried it because I am kinda weak to try the little sting from the cute little bites of these fishes which is known to be a cleansing process by eating dead skin cells. Aside from the skin health benefit, the mini-shock feeling from the small bites can help for smooth blood circulation. Not to mention, the amusement of seeing cute fishes sucking your feet and the tingling effect during the experience. 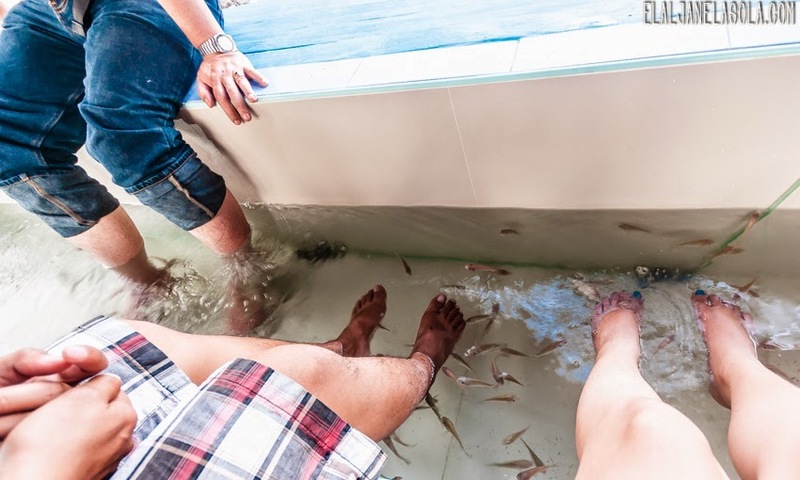 At Tibiao Fish Spa, they offer 3 variation according to size of the kind of fish spa experience you wanted from: small-sized, medium-sized and the large-sized fishes. Well, I finally braved myself and chose the medium-sized, I was shocked at first but managed to endure which lead me to enjoy it afterwards. There were a lot of fishes per sizes but only a few came to my feet, maybe because I was not offering so much dead skin, eh? Aside from the fishes, I love the relaxing feel of the place especially the cute blue pillows because at one time I actually tried resting my back while my feet is submerged in the water. Definitely relaxing! These group of fishes used in the fish spa is actually of a unique kind, and the one in Tibiao is cultured by Floyd, the owner, himself. 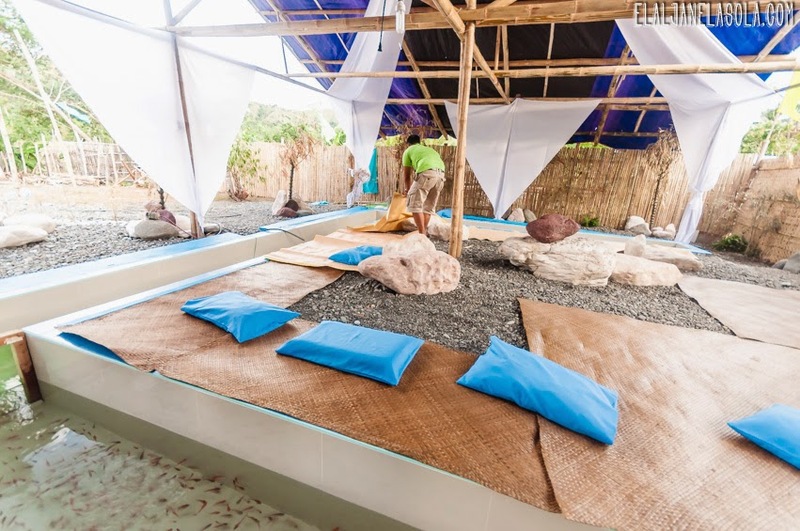 This happens to be a new location after their previous fish spa was devastated with Bagyong Yolanda (or Typhoon Haiyan).